During a recent trip to the Greater Petrolia Area, my cousin Josh and I went to visit Grammie. She is always a delight to spend time with. I started asking questions about when she met Grandad and although I knew she was loving it, she kept looking at Josh and saying "well, she's really digging tonight!". Josh just responded with "Keep talking, I love these stories!" And, away she'd go. I have heard many of these stories before but there were a few gems that emerged that I was unaware of. For example, Grammie lied about her age when she met Grandad! 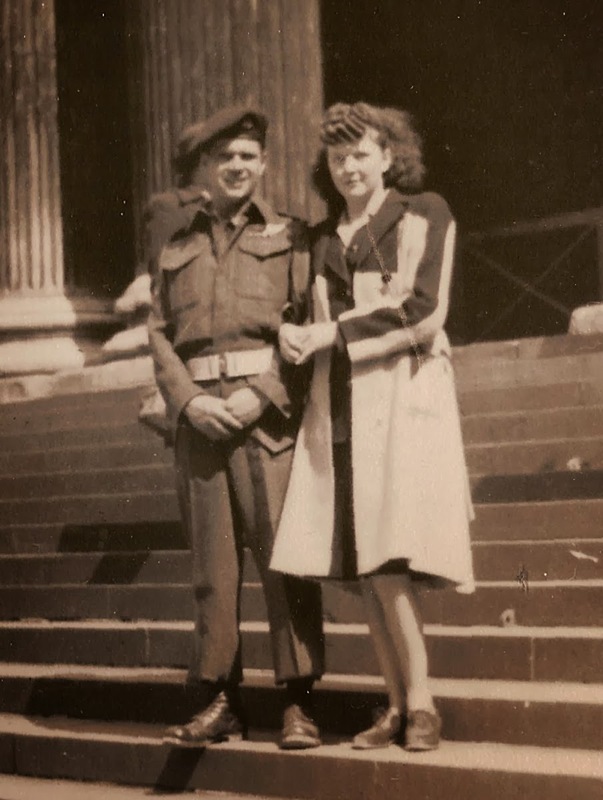 She was just 17 when she, a British Milk Maid, met Grandad - a Canadian soldier in Manchester. But, she lied and said she was 18. He discovered this when they signed their marriage license and she was barely past 19! When I asked her what it was about Grandad that drew her in, her response was adorable. She said "Truthfully? It was his accent. I just loved that Canadian accent." I'm guessing his uniform helped too! That night we heard about how Grandad remembered the dairy she worked for and showed up the next day when she was finishing her shift. We heard about their first date (she got free movie passes from one of her milk customers) and eating fish and chips right out of the newspaper while walking down the street. 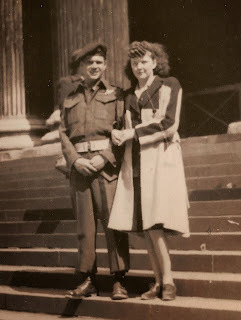 Grammie's Dad, although not a religious man himself, thought any soldier that would carry a Bible in his kit bag was worth having as a husband. Many many times before I had heard that they only got ONE EGG A MONTH during the war. When Grandad came to visit once, he brought a full dozen, carefully wrapped and arriving safely. He was staying on a small hobby farm and they provided him with the precious commodity to bring to his mother-in-law. Josh and I listened intently as she told us about various trains she had to take to visit Grandad and how one time he failed to meet her at the station. He had not gotten her telegram and she was all alone in Euston Station. Fortunately, she located an info. table for soldiers and things got sorted out. Although Grammie has the best stories from many years ago, she is so unassuming and can't imagine why we are so fascinated by her tales. For her, it was just day to day life she was living, but to us it was the adventure of a lifetime and the beginning of our Murray clan here in Canada. Of course I love this! Such treasures, the stories from a Grammie.